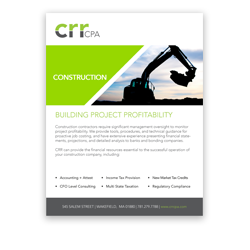 Construction contractors require significant management oversight to monitor project profitability. We provide tools, procedures, and technical guidance for proactive job costing, and have extensive experience presenting financial statements, projections, and detailed analysis to banks and bonding companies. Check out our most recent Construction blog posts!